When you stand at the edge of a cliff and peer over, looking down nearly a kilometre to the valley floor, you feel a flood of emotion – perhaps exhilaration, maybe awe, even terror. You needn’t choose, because all of these emotions can exist simultaneously. You may even feel powerful, omniscient, as though you oversee all you survey. 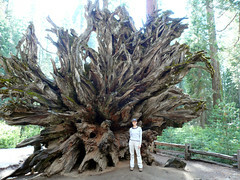 When you sidle up to the roots of a fallen Redwood, however, you feel tiny, because at its feet you ARE tiny. But if you’re very still and you listen closely, you can hear the whisperings of an ancient giant who lived through epochs. I have said before that for me, travelling is about gaining and changing perspectives. Why go anywhere if vicariously living through the window of my television is as fulfilling as actually being there? Because it is not. Imagination and longing, seeing through someone else’s eyes, well, they’re just not the same as actually going myself. In Australia, we watch Getaway and The Great Outdoors mentally adding places and experiences to our ‘to go’ and ‘to do’ lists. Yet, it is when we venture from home – on a day trip, a road trip, or a world trip – when we go somewhere else, that we invite a shift in perspective. I just spent the better part of a week ‘somewhere else’ – two places where I had never been before: Yosemite National Park and Lake Tahoe. I went with Ben, and I have to thank him for taking me, and for being my ever intrepid travelling companion. It is such a joy to travel with him, not only because he is my best friend and I kinda like having him around. But also because I take as much pleasure in seeing his reaction to places as I do in experiencing my own. And Yosemite in particular is a place where reactions are just as epic as the place. I won’t bore you with details of how we got there or where we stayed, just know this: The journey to the park took most of a day, but was a drive through vast and beautiful scenery and small, inconspicuous towns. The place we stayed was a Bed and Breakfast with a giant feather bed, and waffles in the mornings (yum). It offered a stunning view of the nearby mountains, and thoughtfully provided Adirondack (a word I love, but struggle to say) chairs on the deck, from which we watched the sunset while sipping wine and nibbling cheese. 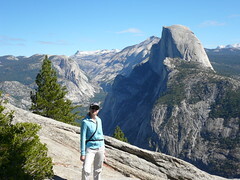 The driving and the staying were a big part of our trip, but the real star of the show was Yosemite itself. We took great advice and on the first of our two full days, we started at the top. 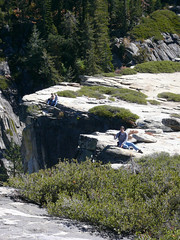 A road deep in the heart of the park, Glacier Point Road, leads to two spectacular lookouts, and the start of many hiking trails. Entering the park from the southern most entry, we wound up and up to the start of GP Road. Not far from the turn off we found ourselves on a rare straightway, and rarer still we were the only car in sight for a mile or two. Just ahead of us were three young bucks standing on the road. As we approached, they skittered away, but were curious enough about us to stay close by and watch us as we slowed up and watched them from the car. I looked in the rear view mirror to see a line of cars approaching and our moment was over, but for the minute or so we regarded them and they regarded us, the forest was still, and so were we. We were in the presence of great beauty. Oh, their eyes! Further along the road we came to Washburn Point Lookout, and this was where I ran out of superlatives. I had been exclaiming “Oh my God”, and “Stunning”, and “Look at that!” for the better part of a day, but nothing had prepared me for the views from this lookout. 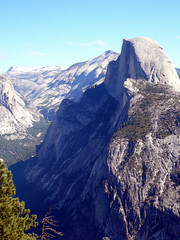 We looked out at peaks named Half Dome, Grizzly Peak and Washington Column. These mountains, these valleys, they were formed and shaped by a glacier. Like driftwood they are convoluted and erratic, yet smoothed and polished by the touches of wind, ice and water, over centuries. They have grey bald heads and thick carpets of gowns that stretch to the valley floor. That day the sky was so blue it almost hurt to look at it. Oh yes, Yosemite was putting on a grand show. We drove further to the end of GP Road, and came to a hub of activity. 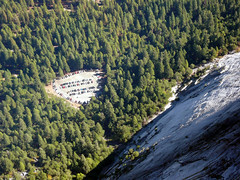 The dozens of people at Washburn Point exploded into hundreds at Glacier Point itself. There was a gift shop(!) and we dodged inappropriately attired tourists wearing thongs (flipflops) and tight jeans. We jockeyed into positions at the lookout walls, and peered over – Ben with confidence and awe, and me with terror and awe. A tiny heart-shaped car park sat nestled amongst trees. And the river was a grey-blue snake rolling along the valley floor. We maneuvered through throngs of grumpy children and cajoling parents, and decided against the 4 mile hike to the valley floor, because the estimated time to get back up was four hours. 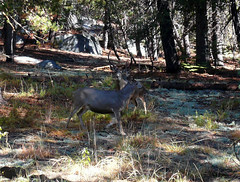 and musty woodlands, where we saw more deer, and we emerged at a rocky vantage point (Taft Point to be precise). 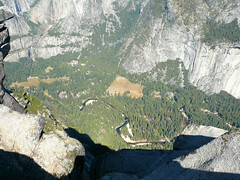 In the distance was a spindly guard rail, but Ben does not consider a sheer drop to a valley floor as imminently dangerous; in his mind he does not need the safety of a guard rail. As I watched in horror, he crept closer and closer to the edge, and then perched on it as one might perch on a park bench if one was going to feed bread to some pigeons. I walked away before I had a heart attack, and went to find cool things to photograph. Sometime later with some coaxing and a vigorous internal dialogue, I got within a couple of feet of the grossly inadequate guard rail and peered into the abyss. It made me hyperventilate, but I did it. And yes, it was an amazing view – for the three seconds I saw it. Did I feel all powerful? No. I could not stop the floodgate of thoughts about falling and suicide and why B.A.S.E. jumpers are so stupid. 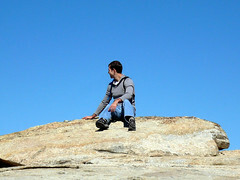 But I loved the brilliance of the blue sky, and from up there my view of it was uninterrupted. 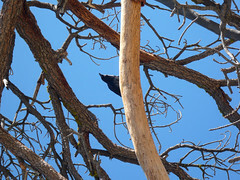 I loved my brief encounter with the crow, whose wings I heard flap before he settled in the bare branches above my head. “Whump,” his wings whispered, then the cawing of that distinctive “AAArkkkk” echoed out across the valley. A few more people came – not many – and we looked like colourful beetles dotting the giant bald head of the peak (and Taft Point is just a ‘blip’ when you see it on the map – a pimple when compared to El Capitan). 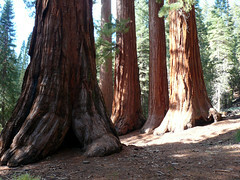 That afternoon, after a lunch of nuts, dried fruit and apples (a lunch we would not repeat again, as we are not chipmunks and it did not fill the void), we waited in line to catch the shuttle to Mariposa Grove, one of three groves of giant sequoias in Yosemite. The shuttle was necessitated by the copious amount of cars already up at the grove; the road was shut to more cars, and this wasn’t even peak season. We squished onto the bus, fitting more people on than I would have believed beforehand. I even asked the driver if I could sit on his lap. A flirtatious septuagenarian replied that of course I could! I thought this might be even more dangerous, so instead I was crushed into the dashboard by the four Polish people who insisted there was enough room on the bus for them too. The ride was short, however, and before long, we were standing amongst giants. Ahhh. The air was so rich with intoxicating smells, we could almost pluck them like berries from a bush. Redwoods smell a bit like pine trees, only deeper, and more ‘heady’. Under that was the earthy mustiness from the wet forest floor, and the top note was smoky. 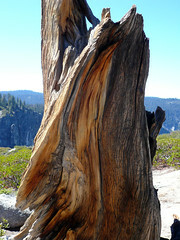 There had been a prescribed burn not long before, and fallen sequoias were still smoldering. We followed the small crowd, seeking out the path that would take us to Grizzly Giant, a 2700-year-old tree, who is 31 feet across at his base. I say ‘he’ because when we finally saw him, he was like a gruff, but loving grandpa. Tall, obviously, but unlike many of the trees around him, his branches reached out. 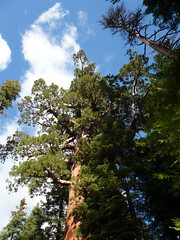 The usual tufts of green that seem to cling directly to the trunks of most redwoods, were extended on thick muscly arms. He was definitely the patriarch of the forest. We took photographs and got as close as we could – his base is protected by the wide girth of a fence. 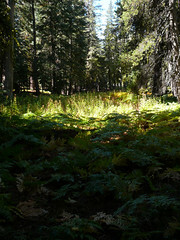 The walk back to the shuttle bus was quieter, as most people had pressed on further into the forest to see more redwoods. We walked back past the Bachelor and his three lady friends, and on to the part of the forest where the burning had blackened the ground. Fallen trunks cut into sections, lay like giant pieces of licorice. 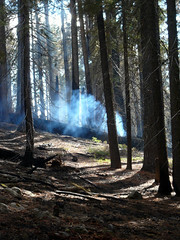 Smoke drifted up from thicker trunks, and in the late afternoon sun, the smoke became another character in the forest. The air here was as thick as the trunks, and I was torn between enjoying the smell of wood burning and wanting to breathe. Just before we emerged from wooded paths into the car park, we stopped at the roots of a fallen tree, and took a couple of photos. How little I was in relation to a being that was old even when Jesus was born. But I didn’t feel small. I felt happy. I loved my first day in the park, and we drove back to our B+B, tired but filled with all we had seen, we looked forward to the next day when we would explore the valley floor by bicycle and by foot. 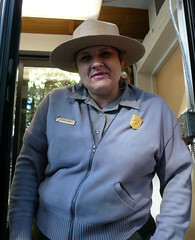 The park ranger in the Yogi Bear hat waved us out of the park. Next time ‘The Valley Floor’, featuring bikes and hikes, squirrels, a bobcat, waterfalls and dry lakes, El Capitan, and a blue, blue sky.